Pioneers in the industry, we offer bernoulli's apparatus, flow measuring device, free and forced vortex, impact of jet apparatus, metacentric height apparatus and pipe friction apparatus from India. As a specialist in this field, we are offering supreme quality of Bernoulli's Apparatus. Manufactured using premium quality components and modern technology in tandem with set international norms; it is well known for its superior finish and high durability. Moreover, the offered range can be availed at reasonable price in varied technical specifications within estimated time frame to our precious clients. 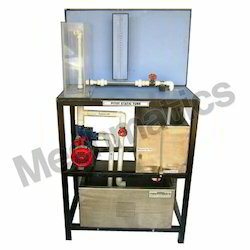 Our enterprise is recognized in the industry for supplying qualitative assortment of Flow Measuring Device. We use modern machines and high-grade components in manufacturing the offered range as per the guidelines of the international quality standards. In addition, we also assure safe delivery of our products. This device is highly appreciated among our clients for its excellent finish and high durability. Clients can avail the offered range from us at very affordable prices. Our reputation in the industry is hugely attributable to our exquisite assortment of Free and Forced Vortex. The entire range is examined under our adept professionals on numerous parameters to ensure its matchless quality and reliability. Widely known for its optimum functionality and long life service, this product is manufactured using standard quality components and innovative tools and techniques. Clients can avail the entire range from us at industry leading prices. 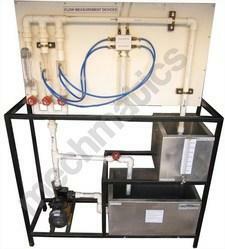 Owing to our vast industry knowledge, we have been able to offer an astonishing range of Impact of Jet Apparatus. The offered range is manufactured using high grade raw material and innovative technology in tandem with globally accepted norms of quality. 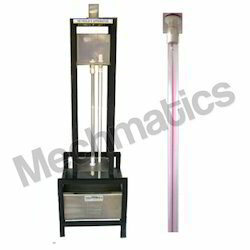 The offered equipment used for the measurement of force developed by a jet of water impinging upon a stationary object. 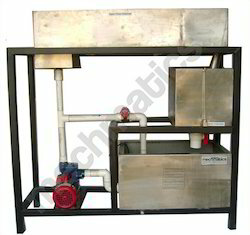 The apparatus offered by us is made available to the customers in varied technical specifications. 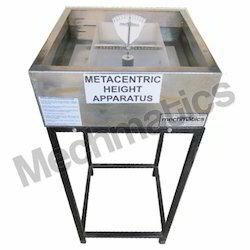 With the assistance of our adept professionals, we are broadly engrossed in offering superlative range of Metacentric Height Apparatus that is offered in various technical specifications as per the varied requirements of our clients. The offered product is manufactured using high end technology and flawless workmanship in our production unit as per the set industry norms of quality. It is extensively used in design and stability of ships, submarines, hot air balloons etc. Assisted with ultra modern processes at our well established manufacturing unit, we are able to offer a wide assortment of Pipe Friction Apparatus. 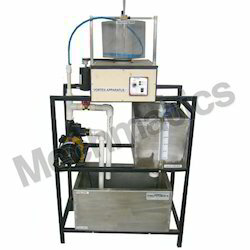 Our offered apparatus is manufactured utilizing standard grade raw material and sophisticated technology in accordance with the globally accepted set of norms. The offered range is highly appreciated in the market, owing to its specific quality attributes and cost effectiveness. Our global buyers can avail the entire range from us with the test pipes such as ½” UPVC pipe, ½” G.I. pipe and 1” G.I. pipe. A good understanding of such losses helps engineers in designing optimum fluid distribution systems, process plants etc. 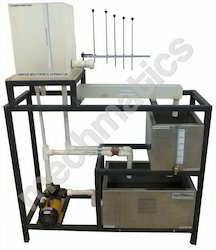 This apparatus is designed to introduce students to major flow losses (Frictional) in Pipes. A flow control valve permits variation of flow rate through the circuit. Pressure tapings are incorporated so that the head loss characteristics of each pipe may be measured. 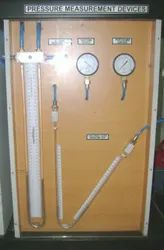 These tapings are connected to an manometer bank incorporating a manifold with air bleed valve. The circuit and manometer are attached to a support framework. 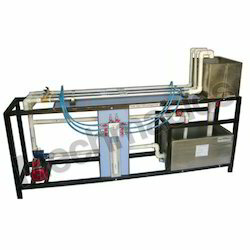 With the facilitation of our vast knowledge, we are highly engaged in supplying superlative quality of Pitot Static Tube Apparatus that is offered in varied technical specifications as per the accordance of our customers. The offered apparatus is tested on rigorous quality parameters before final dispatch to ensure its precise work. 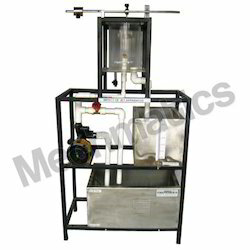 The static tube apparatus is used to measure the static pressure in the fluid stream. 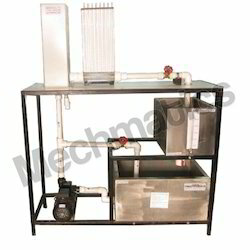 Moreover, our global buyers can avail this apparatus at reasonable price. To meet the diverse demands of our esteemed clients, we are widely engaged in offering an exquisite range of Reynolds Apparatus. 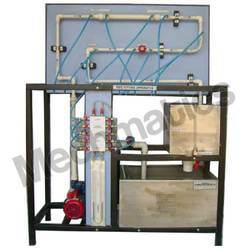 The offered apparatus is highly praised amongst our clients for their quality specific features. 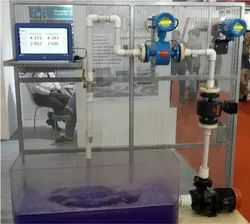 It is used to determine type of Fluid Flow and testing on a scale down models of airplanes and ships by Reynold’s number technique. In addition to this, our apparatus is available in varied technical specifications as per the requirements of our clients. Both orifices and mouthpieces are usually used for measuring the rate of flow of fluid. A constant head tank is fitted with discharge fixture where both orifice and mouthpiece can be fitted. A jet collecting tank collects the discharge and X-Y Trajectory probes measures coordinates of jet. Thus Cd, Cc, & Cv of orifice as well as Cd of mouthpiece can be determined. A flow control valve permits variation of flow rate through the circuit. Pressure tapings are incorporated so that the head loss characteristics of each flow meter may be measured. These tapings are connected to an manometer bank incorporating a manifold with air bleed valve. The circuit and manometer are attached to a support framework. Notches or Weirs allow hydrologists and engineers a simple method of measuring the volumetric flow rate in small to medium-sized streams, or in industrial discharge locations. 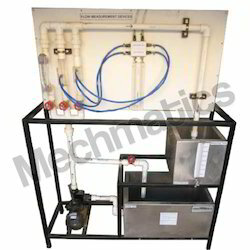 We feel immensely proud to acquaint ourselves as the leading organization and engaged in offering Pipe Fitting Apparatus that is used for designing optimum fluid distribution systems, process plants etc.The offered apparatus can be availed in various technical specifications to our clients as per their application requirements. To deliver a flawless range at our clients’ end, our quality inspectors check the offered apparatus on various stringent quality parameters. Our clients can avail the range at market leading prices within the promised time frame.